How to switch the Windows 8 or Win 8.1 Control Panel, to classic? The Windows-8 Control-Panel is shown by default in "categories" (Image-2 ) and also in the new Windows 8.1! to "Small icons" or "Large icons"
To switch to the well-known from Windows XP Classic View, simply change the type of view in Windows-8 Control Panel. From "categories" to "Small icons" or "Large icons"
all setting options ( Image-3 ) as it is at the old windows! 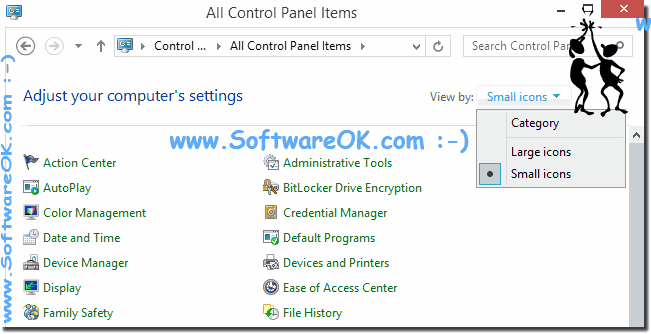 (Image-2) Windows-8 Control Panel in Categories! (Image-3) Windows-8 Control Panel in Small icons View!